Here’s another Degen entry into the pocket size, inexpensive analog category. eBay purchase from China was $13.99 plus $10.00 shipping for a total of $23.99. 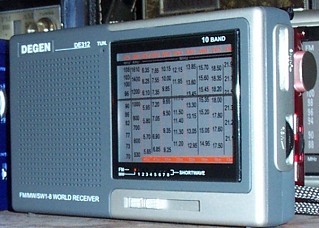 This radio compares favorably with the Kaito WRX911 which retails in the US for $34.99. It is just a bit larger…perhaps 1/4 inch wider and taller. Both radios use AA batteries. The two small radios sound quite similar overall, although the WRX911 has a slightly sharper tone while the DE312 is a bit mellower by comparison. I don’t think of either one as being better…they are really very close in sound quality through the built in speaker, and each sounds very satisfying in earphones. Amenities are few at this price level. Each sports a separate On/Off control, volume, tuning and band selection. Each has a DC input jack and an earphone jack but no antenna jack. Each has a small flip-out stand to angle the radio comfortably on a desk. As you first turn each one on and start tuning around you will find they each feel relatively solid and easy to use. The only thing a little difficult is band selection…each radio has one of those slide levers with positions for each band and a small indicator dot to show which band is selected, although they require decent lighting to be easy to see. Overall the performance of both the Kaito and the Degen are pleasant given their very small size. Sound is not too bad, certainly adequate to catch a newscast or talk show on the go, or with earphones to be a nice little am/fm/shortwave Walkman. Tuning on the small analog dials is a bit of guesswork, especially on sw, although after you learn the characteristics of your particular radio you can identify most of the majors without too much trouble. Sensitivity is a bit better on the Degen…extremely faint and medium strength signals on both am and sw come in a bit more clearly on it. Again, they are close enough that you have to compare them directly to one another to hear the difference, but it’s there. My Degen also has slightly better dial calibration than my WRX911 but I’m willing to bet this would vary sample to sample…I don’t expect excellent dial accuracy at this level, just as long as it is reasonable, and it is on both of these. 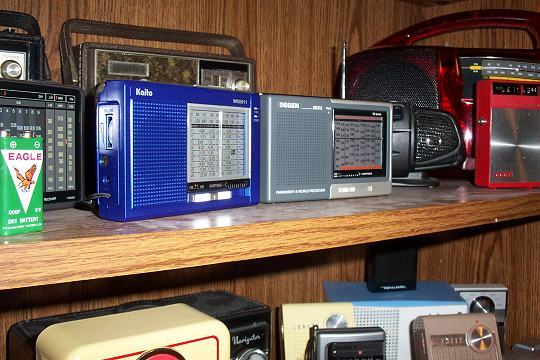 I think people will disagree on the “cuteness factor” of the two radios…the WRX911, at least in the vivid blue color really jumps out at you, but the Degen’s two-tone gray and silver look with rounded corners is somehow satisfying as well…both are neat looking little sets, and both will bring in lots of interesting listening in a very small package. 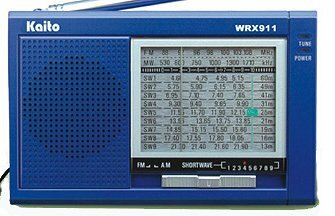 Click below to see the Kaito WRX-911 At Amazon.